SAVANNAH, Georgia, May 19, 2015 – Gulfstream Aerospace Corp., a wholly owned subsidiary of General Dynamics (NYSE: GD), today announced that Qatar Executive has agreed to purchase up to 30 Gulfstream aircraft as part of a Memorandum of Understanding originally announced in October of last year. The original sale called for Qatar Executive to purchase up to 20 Gulfstream aircraft, including the all-new Gulfstream G500. The recently signed final agreement increases the purchase to 30 firm orders and options that are a combination of both of Gulfstream’s new clean-sheet, wide-cabin aircraft, the G500 and G600, and the flagship G650ER. From its start in 2009, Qatar Executive has rapidly risen to become a leader in air charter services for individuals, families, businesses, corporations and governments. As part of Qatar Airways, one of the world’s leading airlines, Qatar Executive’s clients are assured an excellent charter experience. The G500 and G600’s all-new design optimizes speed, wide-cabin comfort and efficiency, and features new industry-leading safety technologies. The G500 can fly 5,000 nautical miles/9,260 kilometers at Mach 0.85 or 3,800 nm/7,038 km at Mach 0.90. 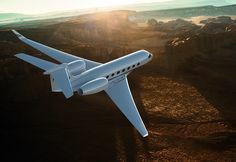 The G600 is capable of traveling 6,200 nm/11,482 km at Mach 0.85 or 4,800 nm/8,890 km at Mach 0.90. The maximum operating speed for both aircraft is Mach 0.925, the same speed as Gulfstream’s G650 and G650ER. The first flight of the G500 occurred on May 18, 2015. Gulfstream projects it will receive type certification from the U.S. Federal Aviation Administration (FAA) and European Aviation Safety Agency in 2017. The G600 flight-test program is expected to begin approximately 12 to 18 months after the G500’s, and entry-into-service is projected to be in 2019. The G650ER, an ultra-long-range aircraft, can travel 7,500 nm/13,890 km at Mach 0.85 and 6,400 nm/11,853 km at Mach 0.90. Gulfstream announced the G650ER in May 2014, and the aircraft received type certification from the FAA five months later. Qatar will take delivery of its G650ER in the fourth quarter of 2015. Gulfstream Aerospace Corporation, a wholly owned subsidiary of General Dynamics (NYSE: GD), designs, develops, manufactures, markets, services and supports the world’s most technologically advanced business-jet aircraft. Gulfstream has produced more than 2,200 aircraft for customers around the world since 1958. To meet the diverse transportation needs of the future, Gulfstream offers a comprehensive fleet of aircraft, comprising the Gulfstream G150TM, the Gulfstream G280TM, the Gulfstream G450TM, the Gulfstream G550TM, the Gulfstream G500TM, the Gulfstream G600TM, the Gulfstream G650TM and the Gulfstream G650ERTM. Gulfstream also offers aircraft ownership services via Gulfstream Pre-Owned Aircraft SalesTM. The company employs more than 15,000 people at 12 major locations. We invite you to visit our website for more information and photos at www.gulfstreamnews.com.